The Society of the Sacred Heart is an international congregation of some 2,700 women in 42 different countries of the world. Sharing the spirit of St. Madeleine Sophie Barat, we are united in our mission: to deepen our understanding of God's love and to discover and reveal that love to the world, through service with the hearts of educators. Religious of the Sacred Heart (RSCJ), share life together in small communities and seek, though prayer and contemplation, to be drawn ever more deeply into the Heart of God. United to God's Heart we are challenged to make choices for justice in response to the Gospel and the needs of the world. Sister Marion does parish work. 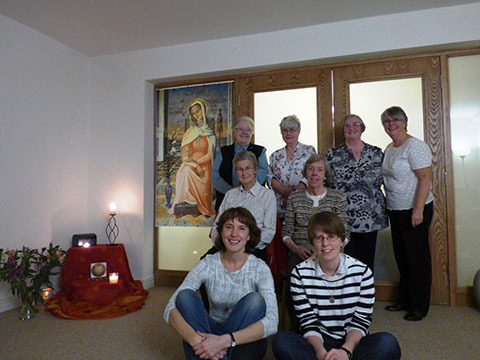 Sister Anne organises and runs days of prayer and leads individually guided retreats. Sister Margaret is Director of Candidates for the province, she runs Capacitar courses and is involved in some work in the parish. Sister Sheila is a spiritual director, leads courses in aspects of spirituality and works in Provincial administration. Sister Siobhan is a maths tutor in the Sacred Heart High School. Sister Barbara is vocations promoter and director of precandidates for the Province and is Vicar for Religious in the Diocese. Candidate Anna is a speech therapist. Sister Doreen works as personal secretary and administrator in the parish of St. Robert's Fenham and has been involved with the Fenham Association of Residents for many years.